Last weekend Marilyn and I drove down to Pacific Grove for a long overdue get away. We had a blast at the Monterey Bay Aquarium, hanging out in coffee shops, eating tasty foods, and walking along the Asilomar beach. 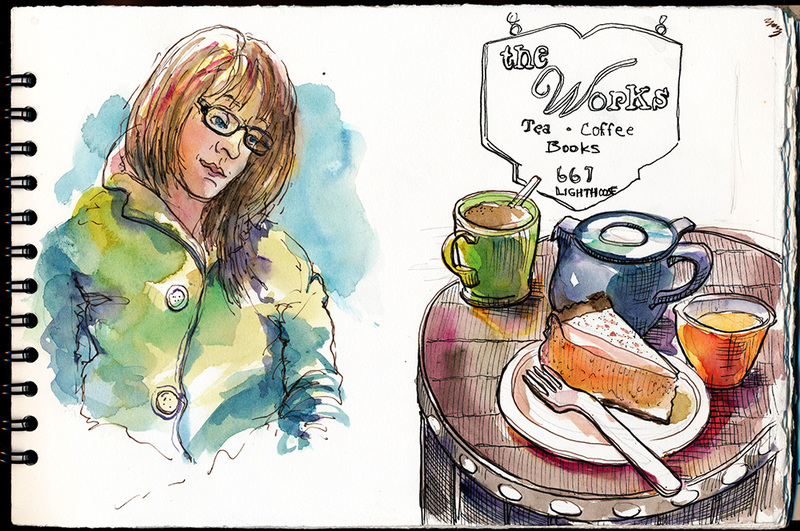 At The Works coffee shop, I had a slice of Pumpkin Cheesecake and a pot of peach white tea while sketching Marilyn. 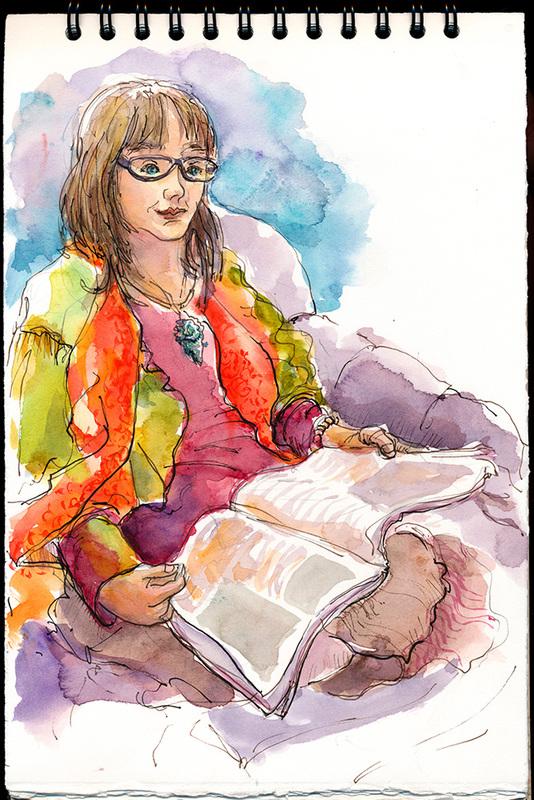 Sketch of Marilyn reading at The Works coffee shop in Pacific Grove. 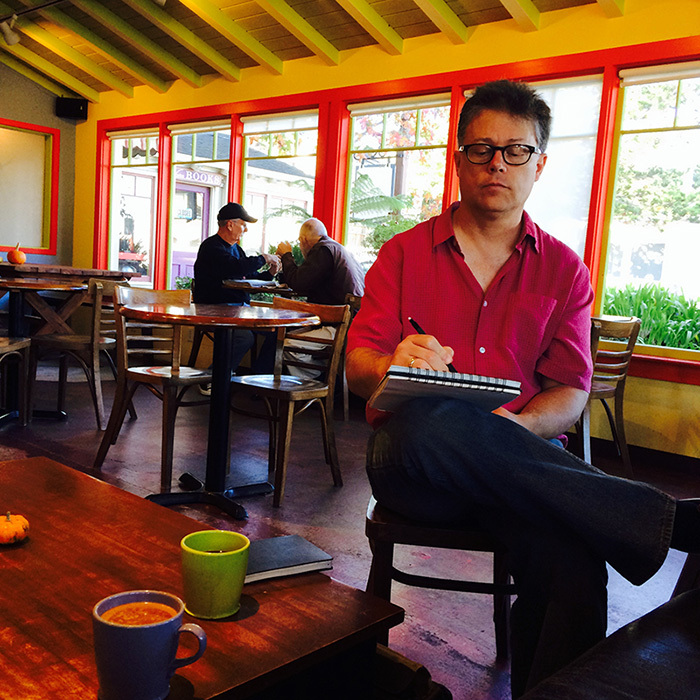 Marilyn took a picture of me while I was sketching her and drinking coffee, of course. The rocky coastline of Asilomar Beach is one of my favorite places to be at sunset.Â It was very windy when I sketched this and I’m surprised I got anything down on paper at all. November 6, 2013 November 24, 2013 Richard SheppardComments are off for this post. Loved this post! Couldn’t comment on it yesterday because I was having technical difficulties (on my end), including that the photo wouldn’t come up on the page. I love that area, and you really captured the coastline. Your sketching must add a whole ‘nother dimension to the simplest daily activities. Thank you Jean! I agree, PG is a great place to hang out whether at the coast or at a coffee shop. We had great food while there, including a noisy but delicious Mexican restaurant called Peppers. Sketching is one of my favorite activities and to do it, I have to actually spend time in a place, not just take a picture of it. It allows me to be get to know a place better, with not only how a place looks, but how it smells, sounds, and feels. Really, it’s meditative. thanks for stopping by!